We've run cycling infrastructure study tours in the Netherlands since 2006. The tours do not remain the same each year because the Netherlands does not remain the same each year. Progress is rapid here. There are always new things to see, always reasons to update the tour. What you'll see below is just a small part of what you can experience on the study tour. We organise open study tours a few times a year but if those dates don't suit you then then private tours can be organised on almost any date for individuals or groups. Why is it that the Netherlands is so successful at encouraging people to cycle ? It's very easy to provide a quick answer: In the Netherlands, cycling is a safe, efficient, convenient and relaxing way to get around and it is this for the whole population, not just a hobby for a very enthusiastic minority. The Dutch success is no accident, it's the result of more than 40 years of continuous improvement to cycling infrastructure, itself the result of continuous investment. Thousands ride along this efficient and safe route every day. Young and old. This cycle-path is not an exception but of normal quality for Assen. Minor damage marked on the ground with paint last year has been repaired. There are no potholes. But what is meant by safe, efficient and convenient ? All these are subjective. A high degree of subjective safety is vital. If people don't feel safe cycling then they won't cycle. Efficiency is also subjective more than it is objective. If it feels like cycling is slow then people think their journeys will take too long by bike. In the Netherlands we see many measures to make distances shorter by bike and to let cyclists avoid busy junctions at which they would have to stop if travelling by car. Convenience is another subjective issue. If cycle parking is remote from the destination then that works against cycling. In the Netherlands you can usually park your bike right next to shops, even in pedestrian areas and inside shopping centres. When new community facilities are built, cycle parking is included. In many other countries, soft measures such as marketing of cycling or cycle training are put before building infrastructure. These measures simply do not work to increase cycling modal share. You can't sell cycling when conditions are less than truly excellent because even if you can convince people to try cycling, if they don't find it to be safe they will give up after they've experienced the unpleasant reality. Cycle training does not lead to more cycling. Mass cycling does not exist without a very fine grid of very good infrastructure which goes everywhere and strong anti-car measures are not required if cycling has been made such that people choose to do it. There are no counter examples. No place on earth has seen dramatic growth in cycling without improving the infrastructure to reduce conflict. The Netherlands is the most successful country by a large margin. The photos in this blog post come from one of last year's study tours. They show the everyday reality of cycling in the Netherlands and demonstrate the essence of what makes cycling so attractive here that the entire population makes a positive choice to cycle. The school run in Assen. Enabled by door to door quality infrastructure. Dutch children cycle from a very young age, well before any in-school cycle-training begins. This is the case because their parents are confident of their childrens' safety. A stretch of cycle-path which joins two sections of bicycle-road. The bridge was built to take motor vehicles over the bicycle path as a socially safe alternative to sending bikes through a tunnel. Before this was built, the cycle-route was interrupted by the main road. When you never have to wait more than eight seconds to cross the road, and when the residential streets on the other side of the crossing cannot be used as a through route by motor vehicles, this gives cycling a competitive advantage over other modes while also improving the quality of life for those who live in those streets. It's not only main routes which need to be wide, smooth, efficient, have priority over a side-roads and be lit at night. This is a secondary route in Assen. On Study Tours we not only look at things, we also take measurements. Yes, the secondary cycle-path is over 3 metres in width. This is important in order to enable relaxed cycling for friends riding together, as in the photo above. It is vital that there is a high density of good quality infrastructure. It's also vital that routes are preserved even during works so that the habit of cycling is not lost. The next parallel route to this is a primary route outside the buildings on the right of the picture, but when this secondary route was dug up due to drainage works, cyclists were given half the road to ride on. The Study Tours also visit residential areas. Woonerven, as seen in this 1980s development, are no longer in fashion in the Netherlands, but lessons learnt from them are still to be seen in more modern residential developments and have even been retrofitted to older residential areas. In the Netherlands, people smile as they cross busy dual carriageway main roads by bike. In this case, the road is in a tunnel so that we can cross in daylight and nearly on the level. Integration with public transport is important. In the Netherlands, there can be hundreds of bicycle parking spaces at bus-stops and many thousands at increasingly beautifully designed railway station cycle-parks. But it's also important to make sure that buses don't cause danger to cyclists and that's why there are many well designed bicycle bypasses of bus-stops. Recreational routes from the city into the countryside are provided for by spectacular bridges and take people by pleasant cycle-paths and nearly car free roads to all destinations. Providing accessible recreational cycling is part of what has enabled cycling to become normalized across the entire population. None of what is shown in the photos above is exceptional. Far too much attention is paid to isolated exceptional pieces of infrastructure when what is actually they are nearly not important at all. We show a few special most important is to have a very high density grid of very good infrastructure as shown here. Everyone likes to see good examples but in our view it is important to note where things have gone wrong. While the Netherlands is the best place to find good examples of how to cater for cycling, this country is by no means perfect. It's important to copy only from the best examples. Groningen has roads on which there are simply too many buses and too much conflict with cycles. If cyclists choose to ride on the pavement (sidewalk) this is a very clear message to planners that they have made a mistake. Also in Groningen, this notorious roundabout has been the scene of many collisions. There are better roundabout designs than this. There were 38 reported crashes here between 2007 and 2012. On the Study Tour, we illustrate why these sites do not work well. As well as those examples, we also visit the most dangerous junction in the whole of the Netherlands, a gyratory system in Groningen. There are lessons to be learnt here. Promising to add inadequate cycling infrastructure to busy gyratories is absolutely not the path to more, safer and more pleasant cycling. Please take note, London ! Political support is important, but cycling should not be a partisan issue. All sections of society can benefit from cycling. 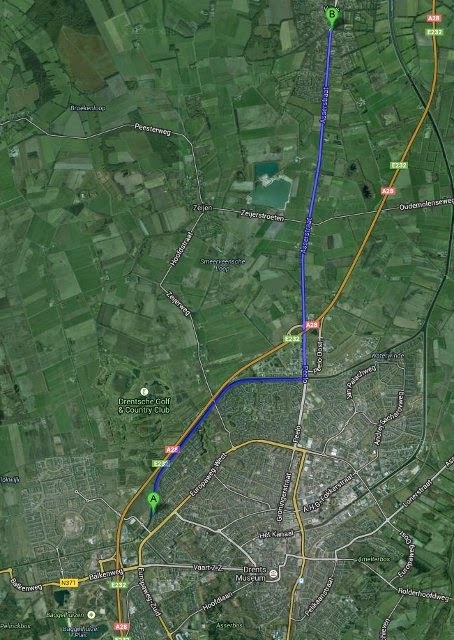 The first third of the route to Groningen, for which improvements are promised after the local elections. This will be familiar to previous study tour participants, though the study tour proceeds more slowly in order to explain and observe. One of the parties which gained most in in the local elections made a campaigning issue out of a demand for a "proper cycling superhighway" between Assen and Groningen. This prompted me to make the video above which shows the first third of the existing route to Groningen as a sort of video time-lapse. The start point is just 200 metres from our home and we reach this point in just 30 seconds of cycling along a non-through residential street with a 30 km/h speed limit. This route shown may not be called a "superhighway", but it's already a very efficient route by bike and already well in advance of the sort of infrastructure which would be given a dramatic name in other parts of the world. I'd be delighted to see further improvements here, of course but the name of the path doesn't matter so much to me. Another local political party criticised a Shared Space junction in Assen and promised improvements. This newly renovated junction really is not satisfactory. There are too many conflicts here. Last year we took groups of study tour participants to see the newly opened junction so that they could observe the conflicts for themselves and in order to help them to understand why Shared Space doesn't work. At another location in Assen, Shared Space has been removed. It's been converted to a cycle and pedestrian space and this is a popular change. That will be part of the Study Tour this year. Get in touch to book a place. This year we're also running a follow-up tour for people who have been on previous study tours. This will provide an opportunity to catch up with what's changed in the Netherlands. It's also good for people to be able to re-set their expectations. It can be difficult to keep up expectations for years after returning home. For these reasons we're welcoming back everyone who has been on a study tour in previous years. Get in touch to find out more. Berno asked me to update this blog post to mention the type of bicycle ridden by most Dutch people. Dutch utility bicycles are an enabling technology for mass cycling because they allow un-fussy cycling. Almost everyone in the Netherlands owns a bike like this and uses it for everyday reliable transport, even if they ride something entirely different for sport or touring at weekends. Please read an older article about these bicycles. Another year without progress in London. Ever get the feeling you've been cheated ? On the 4th of March 2013, Andrew Gilligan wrote of his and Boris Johnson's "ambitions for the bike". He set the scene for what was to follow by claiming that "it took 40 years to turn even Amsterdam into Amsterdam". Today is the 4th of March 2014. London has not made any discernible progress towards becoming a proper cycling city in the last 365 days, so as of today, the automated counter on the right (code to embed it on your website or blog is produced by clicking on "embed this") has updated itself to report than the UK is now 41 years and zero days behind. It may seem a little harsh to use Andrew's "40 years" statement in this way, but I'm very bored indeed of hearing this very well worn excuse for inaction. It was about twenty years ago when I heard "we're n years behind" being used to excuse the UK's bad cycling environment. At that time, those people who said this could only claim that the Netherlands had a twenty year head-start. The only change since then has been in the number of years by which people admit to being behind. While the Netherlands has continued to progress rapidly, the UK has continued to stagnate. The gap can only get bigger while the UK does not progress. Can progress be made in less than 41 years ? Yes it's dated and much of what is shown is no longer to current Dutch standards, but look at what had been achieved in just 17 years in the Netherlands. Britain could have started to copy from this film 24 years ago. i.e. the UK could easily now look better than the Netherlands did when this video was made, but it doesn't. I apologise if you think you've seen this before. You may well have done, perhaps on a study tour, or it could have been in an earlier post on this blog as this is the third time it's been featured here. The video shows the impressive result of just the first 17 years of work since policy changes in the 1970s in the Netherlands. I first wrote a blog post featuring this video six years ago. Back then, Britain was only "35 years behind the Netherlands", but unfortunately nothing of any substance has been achieved in Britain in those six years. After the Netherlands changed its policies on cycling in the 1970s, it took just eight years until the country was impressive enough that New Scientist magazine ran an article about what had been achieved. In eight years, the Netherlands had already achieved more than London has managed when given those same eight years plus an extra 33 years which followed after the wake-up call from New Scientist. To reach the point where the Netherlands was worth taking notice of took barely more than the six years between when I first posted the video above and the present day. It actually took less time than Boris Johnson has already been mayor of London (he has had this position since December 2005). Even now, when they are "41 years ahead", the Netherlands is not standing still. We have seen rapid progress here in the last six years, making the infrastructure in the video look even more out of date now than it did when I first embedded it. Meanwhile, Britain has not progressed in any meaningful way in that time. Dutch infrastructure has changed enormously since the 1970s while Britain's still looks very much as it did in the 1960s. Cycling was in decline in both Britain and the Netherlands until the mid 1970s. It took a second revolution in Dutch street planning to reverse the decline here. As yet, that second revolution has still not taken place in Britain. This post started by referring to Andrew Gilligan's claim last year of London being 40 years behind. He said this in order to pave the way for the introduction four days later of plans which were supposed to make London "compete with Amsterdam". The level of hype was immense. After reading the plans I was immediately critical because it was very obvious that these plans could never achieve the stated aims. The document was long, the language was slick, and it alluded to things "Dutch". However, all that was really being offered were a few minor changes around the edges which could never achieve the stated goal. London appeared to think that it could "catch up" by spending "a third of as much as the Dutch and to do so for just ten years". Nowhere was it proposed to create the extensive grid of high quality go everywhere facilities necessary to result in a high cycling modal share. London has has continued to borrow the names of things Dutch to describe infrastructure of far from adequate quality. Schrödinger's Cat pointed out that London had begun to use the word "grid" to describe a much lesser quality network of routes and that "the plans are already failing to live up to the promises made" (I introduced the term "grid" to describe this important feature of Dutch infrastructure in 2008). I visited London myself last year and was extremely disappointed with what I found. Nothing had changed for the better for cyclists. While there's a lot of hot air about cycling, there is no "cycling revolution". It's clear from their lacklustre and old-fashioned proposals that TfL still doesn't really have much of a clue what they are doing for cyclists. London actually took some small steps in the early 1980s, and had they continued then the city might have been transformed. Unfortunately, instead of continuing along this path, it was abandoned. The city still does not have infrastructure of the quality required to make it a truly pleasant and safe place to cycle. We now know that Londoners' journeys are not different in length or purpose to journeys made by their Dutch counterparts, but cycling in London remains something that most people wouldn't consider. It's an activity for those who are either brave enough to accept the challenge, hard-up enough that they have no choice, or who are somewhere on a spectrum between those two extremes. When there was a string of fatalities last year, Boris Johnson and Andrew Gilligan blamed cyclists rather than acknowledge the inaction of themselves and those who came before them had led to cycling being inherently dangerous as well as unpleasant in the city. More recently, London's mayor has said that he still thinks properly designed cycling infrastructure is "totally pointless". These people are not working for cycling and we should not let them get away with pretending that they are. London's horrible plan for Kings X. Perhaps in an attempt to forestall the inevitable criticism which would follow from having achieved nothing of substance over the last year, London has been sending out yet more press releases. These have been reported far and wide, including here in the Netherlands. The new publicity appears to have done its job. Campaigners have almost completely forgotten about the promises made but never fulfilled last March because they're looking instead at the latest promises. Once again, it's "jam tomorrow". Once again, many campaigners are being tricked into thinking that the promise will come true. The new announcements are actually even more lacklustre than last year. Rather than promising that the whole city will be transformed to "compete with Amsterdam", they're now promising only to transform 33 junctions. This isn't even new. It's a recycled version of the "junction review" which was promised to Londoners two years ago. To put the proposal in context, 33 junctions are to be reviewed out of thousands of road junctions in London. 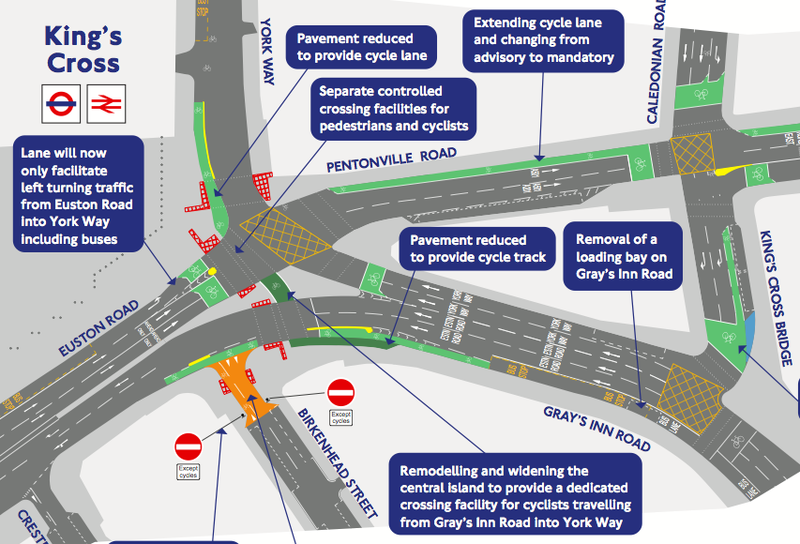 Even the proposals for these junctions have led to criticism because the proposals are lacklustre. Even if London does manage to deliver what has been promised, the city will still fail to deliver what is needed because the promises made in the last week are so lacking in scope. This has not stopped the London Cycling Campaign from adding to the hype. On the day of TfL's press release, LCC sent out two press releases of their own which praised the promises from TfL. They "congratulate the mayor" and talk about "success for campaigners". But when the city's mayor has has done so little for cyclists and he also so recently made it clear that he doesn't understand what is needed, what are campaigners cheering about. This is not a time for praise, it's a time for sensible consideration of what is, or perhaps what is not, on offer from London's Mayor, Cycling Commissioner and TfL. Cycling in London needs action, not words. It needs real campaigning and not mutual back patting, and will benefit greatly if campaigners can somehow forget about their amnesia, remember how things have not turned out according to press releases in the past and try to make sure that this situation doesn't continue. That promises made to cyclists are always about tomorrow is the reason why Britain is 41 years behind. This is an ongoing emergency. Change is needed urgently. In London and in Britain as a whole, cycling is something that most people simply never do and this lack of cycling kills people. 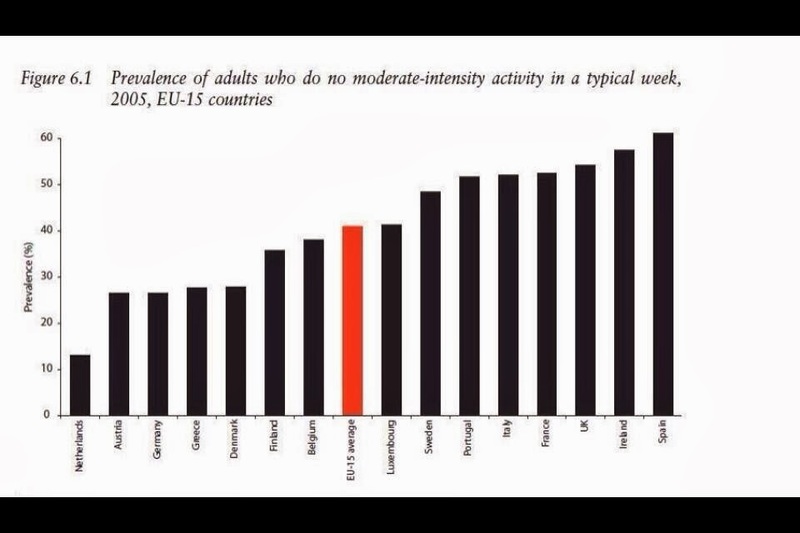 The health of the average Dutch adult benefits from having the best chance in Europe to incorporate a little healthy exercise into their daily lives by cycling. Meanwhile, British adults are near the bottom of the list. Dutch children have enormous freedom and are considered by UNICEF to have the best well-being in the world, while British children are at the bottom of the list. Campaigners and government alike have produced manifestos, reports and any amount of hot air in Britain for decades and they still continue to do so. None of that will get people cycling. Nor will more cycle training. To get people cycling you need infrastructural change, and you need that infrastructure to be of the best quality possible. Britain needs to start planning and building that high quality infrastructure. Stop writing press releases and get on with actually doing something. Don't delay. Start now. Having sat back for 41 years already, time is of the essence. Cost is not an issue. It's cheaper to build cycling infrastructure than not to build it. Think rapid progress isn't possible in the UK ? Watch this video which demonstrates how much can be achieved in little time when the British government has found a project that it really wants to support: "The entire 55 miles of dual carriageway, 132 bridges and 92 concrete culverts are due to be completed within 19 months". Everyone involved was "inspired with a sense of urgency". "After only 16 weeks of construction, the record of progress was remarkable". In the Netherlands, cycling projects are built with a similar urgency. Speed is essential when rapid progress takes place over many years. To build Britain's motorway network, many big things had to be done as well as small things like changing laws and moving kerb lines - the sort of small problems seemingly regarded as insurmountable obstacles when it comes to cycling infrastructure. I pose again a question from last year: How much time do you think you have ? At the current sub-glacial rate of change, no significant improvements can be expected for British cyclists within the life-spans of anyone campaigning now. Having low aspirations will never result in the change that is required. Come and find out how to do a proper job. Take what you learn back to the UK. We can show you how to make cycling accessible to everyone so that everyone wants to cycle. We're here to help, but we can only help those who actually want to be helped. The hype continues. London's "smart" pedestrian crossings. In the week after this blog post, London achieved considerable publicity yet again (not only within the UK but also extending to the Netherlands) for plans to trial a new pedestrian crossing innovation which is claimed to improve conditions for pedestrians. In fact, crossing the road in London is a harrowing experience (as I demonstrated last year). In recent years, pedestrian green times have been shortened and shortened again, and the number of pedestrian crossings in London has also been reduced, making pedestrians' journeys longer if they wish to use a pedestrian crossing to get across the road in relative safety, or their crossing more dangerous if they do not. What's more, London uses the concept of a countdown timer on pedestrian crossings to tell people to run faster because its not long until motorists will be given a green light, while in the Netherlands it's used to demonstrate that the delay before we can cross the road will be short so there is no need to hurry across, possibly in danger. While on the subject of delays before crossing, these can be extraordinarily long in London compared with what I'm used to in the Netherlands. We have a maximum delay of 8 seconds for pedestrians and cyclists at many of our crossings. However, while London is achieving press around the world, including here in the Netherlands, for its "innovation", almost no-one knows that the experience for pedestrians is in fact far better in this country than it is in the UK. Not only Britain's cyclists but also Britain's pedestrians would do a lot better if more effort was put into actually achieving a good environment rather than simply writing press releases. British campaigners: here's a message from the 1970s which is especially pertinent to the current situation for cyclists in the UK. How can we tell if we have true mass cycling ? If school cycle parking is full every day including winter, if railway stations struggle to build extra parking spaces quickly enough to cater for ever increasing bicycle usage, this crisis is reported in newspapers which are critical of more cycle parking not being built more quickly, and if city centres also have this same problem then perhaps you really do have true mass cycling. One of the first photos of the centre of Assen which I took just after we moved here. It's a normal day and there are hundreds of bikes everywhere. Cycle parking in the centre of the city has been expanded and improved twice in the last six years, as have many things around the city. If you have all these problems then you have true mass cycling. Assen certainly does have this problem. Other Dutch cities have all the same problems because similar policies have led to similar results right across the Netherlands. Everyone cycles. Children, students, commuters, older people, slow or fast, women and men, people with disabilities, immigrants. Everyone. That's why cycle-parking is particularly an issue. pole. Not everyone would do this. How can we tell if we don't have true mass cycling ? Cyclists are the coal mine canaries of our towns. If cyclists are few and far between, frequently dress in canary yellow, wear helmets, face masks and other protective equipment, are largely of an identifiable cultural group (often male 20-45 years of age), they're viewed as an out-group, openly hated or picked on by the local press and if you simply don't see bicycles being used in the numbers that you see them in the videos above then you do not yet have true mass cycling. How can we create true mass cycling ? If you want mass cycling where you live, you must first identify where future cyclists can come from. Non-cycling adults who do drive. Children don't get much choice about how they travel as their choices are made for them by their parents. This applies equally to those children who are allowed to walk, cycle or take public transport independently as it does to those who are not. Every parent cares for their children and every parent tries to do what they see as the best, safest, most convenient, thing. Campaigning for the right of children to be able to make independent journeys by bicycle in safety could benefit a lot of people. We know that there is widespread concern about safety and about health and we know that cycling offers a solution to these problems. We also know that cycle training on its own does not lead to more cycling. Cycling only becomes attractive if it is made safe and convenient. UNICEF rates Dutch children as having the best well-being in the world and this comes in large part because they have freedom to make their own journeys by bicycle. Shouldn't all children be so lucky ? People who are dependent on public transport often complain about the problems that they have with their transport. It's expensive. It's indirect. It's time consuming and there are delays. Public transport is not seen as aspirational and is often viewed as second best to owning and driving one's own car. It's difficult to make people choose public transport unless forced by being unable to afford their own transport. Public transport usage is highest in countries where it is more difficult to own and use cars and lowest in countries where cars are most affordable. However, users of public transport can be offered another alternative: the bike. In wealthy countries where cycling has been made accessible and convenient, public transport usage remains at much the same low level expected due to wealth but that bicycles offer a positive choice that people will take instead of using cars. they don't feel safe in this situation. Most people would rather drive here. Non cycling adults who drive are actually in a very similar situation to those non-cycling adults who do not drive. They don't want to take public transport for the reasons listed above and cycling is simply not seen an option for most people in most countries so they are taking what for them is the easiest, safest option. Driving doesn't have to be the only option: wealthy countries which have made cycling accessible and convenient find that while their public transport usage remains at much the same low level expected due to wealth, people will make a positive choice to cycle rather than to drive. There is an odd idea even amongst cycling campaigners that drivers will only give up driving if it is made too expensive or too inconvenient. This has always struck me as an odd position to take for someone who chooses cycling for him/herself because even that person is making an assumption that driving is a preferable option for anyone who can afford it. The Netherlands does not demonstrate this to be true at all. Amsterdam is an easier place to drive in than many other large cities. In most places, car parking is neither difficult to find nor expensive. Running costs and fuel are about the same as elsewhere in Europe. Dutch people who have a choice of cycling or driving make a positive choice to cycle because it fits their needs. Cycling is often the easiest option in the Netherlands not because driving is particularly bad but because cycling is particularly good. I think it's very important to remember that present day drivers in other countries are in exactly the same situation as everyone else. They are taking what appears to them to be the easiest safe option. The main reason why people drive is that because for them this is the least bad way of getting about. We know already that Londoners make the same journeys by car as Dutch people make by bike, but it's not only the distances and purposes which are the same. The motivation to drive in London is exactly the same as the motivation to cycle in the Netherlands. Whether the choice is made to cycle or to drive, that choice is based mostly on what feels safe and is convenient. If cycling was easier than driving and just so safe then this would attract current day drivers to ride bikes instead. If cycling campaigners as a small out-group confront drivers as if they are the enemy, this can only be counter-productive. It is also completely unnecessary. The Netherlands has achieved the highest cycling modal share in the world without being harsh on drivers. The carrot is stronger than the stick. So what does attract people to cycling ? That's easy to answer - a comprehensive network of very high quality cycling infrastructure which offers shorter faster journeys, fewer stops and on which people feel very safe to cycle. This is what makes cycling attractive and makes cycling into a positive option rather than something which it is a struggle to convince people to do. This is also exactly what the Netherlands has built. This country has achieved a greater level of success than anywhere else and that is why it makes sense to learn from this Dutch success. This photo illustrates a "problem"
up the entire cycle-path as they do it. find a photo which showed this. Apart from a lack of cycle parking, what else do people complain about where there is true mass cycling ? I went on a recreational ride with some local cyclists this morning and the conversation in a cafe turned to a familiar topic: School children slowing them down. To me, this is a very nice problem to have. It's a problem which only exists because school children actually do cycle in the Netherlands. Other common complaints are from older cyclists complaining that sport cyclists go too fast and don't use bells and from sport cyclists complaining that older people riding together go too slowly and don't hear bells when they're rung. There are occasionally small conflicts but these are all minor issues in reality. The one topic almost guaranteed to trigger a response amongst Dutch cyclists is mopeds. In this country, moped riders are an identifiable minority. Mopeds are ridden for a similar small proportion of total journeys as are bicycles in countries such as the UK or USA. Moped riders are an out-group in the Netherlands just as cyclists are an out-group in other nations and many of the same prejudices which are applied to cyclists in other nations are applied to moped riders here. In particular, Dutch people often think that mopeds are exceedingly dangerous when in fact they are not nearly so dangerous as they are commonly thought to be. Complaints about cycling in the Netherlands can be seen as an examples of "First World Problems". Dutch cyclists have relatively little to complain about in comparison with their counterparts in other countries. If we had to ride with trucks passing centimetres away and deal with cycling infrastructure design which was as poor and inconvenient to use as is often the case in other countries and if society as a whole seemed to be against them as is the case for cyclists elsewhere then these concerns would be of greater importance here than the relatively minor concerns that people see as a problem. A word about "bike culture"
In the past, I might have tagged a piece like this "bike culture" and thought not too much of it. Unfortunately, I think the term is being misinterpreted. The Dutch do not cycle simply because they "have cycling in their culture". The "cycling culture" of the Netherlands is the direct result of infrastructure which makes cycling pleasant, convenient and safe. When Dutch people leave this country and go to live in a place without good cycling infrastructure, they give up on cycling. When people migrate to the Netherlands from places without cycling infrastructure, they start cycling. The Dutch respond to their built environment much as does anyone else, wherever they were born.